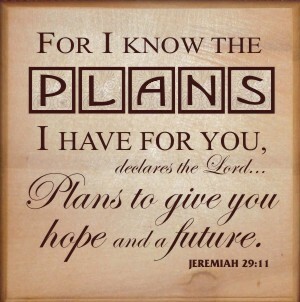 For I Know The Plans I Have For You…. Have you ever asked – Where is God? Why doesn’t he answer? Is He even listening? How many of you know Jeremiah 29:11? The truth is that you will be in Babylon for seventy years. But then I will come and do for you all the good things I have promised, and I will bring you home again. You see, God had just told Jeremiah that the Israelites were going to be staying, in captivity, in Babylon. In essense, God was going to withdraw his glory for 70 years. They would be taken care of, but it was going to be in God’s time and not theirs. You see, God periodiocally withdraws Himself from our life (imagine a veil) so that we will draw closer to Him. God doesn’t want us to love Him because of what He can do for us. He wants us to love Him because He Is God. He is “the Name”. He’s not our buddy, pal or friend. He’s all powerful; a terrifyingly beautiful God who can’t even show us His full glory because we couldn’t stand it. I cry out to God without holding back. Oh, that God would listen to me! When I was in deep trouble, I searched for the Lord. All night long I pray, with hands lifted toward heaven, pleading. There can be no joy for me until he acts. I think of God, and I moan, overwhelmed with longing for his help. You don’t let me sleep. I am too distressed even to pray! I think of the good old days, long since ended, when my nights were filled with joyful songs. I search my soul and think about the difference now. Has the Lord rejected me forever? Will he never again show me favor? Is his unfailing love gone forever? Have his promises permanently failed? Has God forgotten to be kind? Has he slammed the door on his compassion? Does this sound like someone who is hearing from God? No! If you continue reading, you see that the Psalm will show you a full range of emotion. From dispair to pleading to remembering the good times when God was there, to acknowledging the faithfulness of God. I really love reading the Psalms. They are packed full of gut-wretching emotion – something I sometimes have a hard time letting out myself. So what’s the point of all this? It’s something I’m learning the hard way. Lately, I’ve felt that God was distant. There were days when I couldn’t even pray – I didn’t have any words. I’ve cried, yelled, lashed out at anyone and everyone. I’ve had anger and bewilderment. I still don’t know what happened. But there is one thing I do know. I’m not perfect – God is. And there is hope. In God’s time, He will be there. When you have drawn closer to Him, he will listen when you pray. He says, “I will be found by you.” That’s refreshing. That’s something to look forward to. That’s hope! He continues: I will end your captivity and restore your fortunes. In God’s time, He will make himself known to you again and will reward you for your faithfulness. Want another example? Read Job. Wow – what a powerful message. Jer. 29:11 is inspiring – adding v. 10 into the mix adds a different perspective. Thanks for sharing your heart, my brother.